India has primarily been a continental power. Over the centuries, there have been many recounts of glorious warriors in Indian history from Chandragupta Maurya toAshoka the Great coming down to Rana Pratap and Shivaji in medieval times. Having been endowed with sufficient resources for development within, there was no need felt to foray abroad particularly by sea unlike the European powers. But for a brief period during the Chola dynasty and the Maratha sea farer, Kanhoji Angre, India's maritime exploits have been fairly modest. 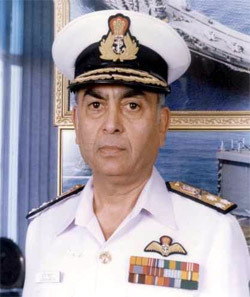 The modern Indian Navy is apparently going against this historical strain with India's newly appointed Chief of the Naval Staff, Admiral Sureesh Mehta, a Naval flyer indicating that a priority for the Indian Navy would be to build assets which could enable it to influence areas beyond the littoral waters and extend its reach internationally. The service was also said to be in a process of transformation. The key operational parameters highlighted include enhanced maritime surveillance capability, network centricity to link all assets in a common frame work and ships which could extend the reach of the Navy. The Indian Navy is thus seen to be making an attempt to make its mark in the waters of the Indian Ocean and beyond. This process is seen to be following a fairly structured path. The first step has been to provide a theoretical foundation through the framework of enunciating the country's maritime strategy. The Maritime Doctrine was released by the Navy in 2004; this has been followed by the Maritime Capability Perspective Plan, which is stated to be a classified blueprint of the force-level structure of the Navy for the next decade and a half. This was finalized in May 2006. "Freedom of the Seas: India's Maritime Strategy", again a classified document, was released on 17 October denoting the Navy's vision for the future. Refreshingly all this information has been shared by the Ministry of Defence on its web site, perhaps the impact of glasnost in the media age. The strategy to follow up on these conceptual foundations denotes a process of transformation. This has been outlined in another set of publications, "Vision Statement of the Indian Navy", "What Does Transformation Mean for the Indian Navy?' and "Strategic Guidance for Transformation". Admiral Mehta is thus well set to implement the theoretical course set out in these documents over the next couple of years of his tenure as the Chief of the Naval Staff. The preaching's having been in practice over the past few years and India has been cooperating with other navies in the region particularly South East Asia to include Indonesia, Singapore, Malaysia and Japan as also attempting to patrol the Straits of Malacca. This has been a highly sensitive issue, not only with South East Asian states but also with China. In the overall ambit of India's, 'Look East' policy, the Navy will continue to play a major role in this region. Its assistance during the Tsunami in 2004 was highly appreciated by the recipients. Another facet is of course joint training. The Indian Navy's plans for joint training in 2007 are fairly ambitious. A flotilla will first conduct exercises with the US Navy in mid 2007 in the Pacific Ocean and then follow it up with the Russians in Vladivostok. It will also interact with the Singapore Navy and make port visits to Japan, South Korea and the Philippines. The new found confidence is also reflected in the acquisition process. The Navy is not willing to acquire mere hand outs or discarded equipment. The Indian Navy is reported to have declined Eight British Sea Harrier fighter jets offered after a phase out by the Royal Navy to replace six jet trainers. These were seen to be devoid of main components such as missile carrying pods, fire control radars and other essential avionics. An option for up gradation was examined, but not considered viable. British Hawk trainers which are being inducted into the IAF shortly may now be considered. India's acquisition of the Gorshkov from Russia has led to induction of MiG 29 in the Navy. Training to acquaint Indian pilots with these aircraft is being undertaken in the USA. Thus a Russian made aircraft, to be flown on a Russian aircraft carrier by Indian pilots to be trained at an American air base, surely makes for a global model in defense cooperation. The need for a rapid responsive Navy was also highlighted during the Lebanon crisis during the Year, when a large number of Indians had to be evacuated from Beirut; it quickly rose to the occasion. The speedy action undertaken perhaps helped to save many lives. But there is a long way to go before the Navy could be said to be effectively capable of extending the reach as envisaged by the new Chief. It would require much larger defense allocations than made recently to expand its fleet, build a multi dimensional capability and create a blue water Navy in pursuit of peace and stability in the Indian Ocean. This is perhaps the dream of every Indian mariner today.